The New Jerusalem Bible: Standard Edition will satisfy the great need for an authoritative version of "the greatest story ever told" in a package so attractive, user friendly, and affordable, this edition is destined to become a classic. Using the same translation that has been hailed as "truly magnificent" (Journal of Bible Literature), the Standard Edition has a completely redesigned interior, set in a two-column format for easy reading. With all the best features of much more cumbersome and costly versions, this Bible is a must-have for home, church, and school. 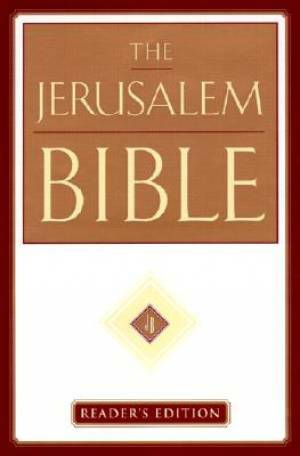 New Jerusalem Bible Standard Edition was published by Image Books in September 1999 and is our 32926th best seller. The ISBN for New Jerusalem Bible Standard Edition is 9780385496582. Be the first to review New Jerusalem Bible Standard Edition! Got a question? No problem! Just click here to ask us about New Jerusalem Bible Standard Edition. Please can you let me know the size of the text in this bible? A:This has a point 9 font size. Thank you for using the Q&A Forum.